We learned to make this play dough during Roscoe's time at the Richmond Waldorf School. 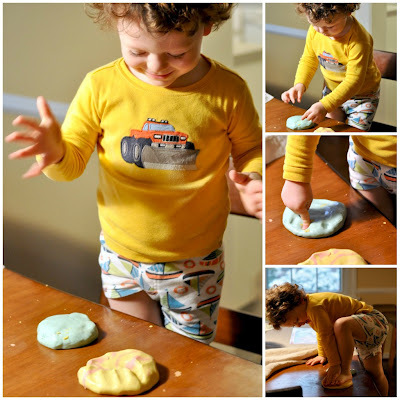 It's a nice squishy dough that is best for sensory play, rolling out, making imprints, and other activities that don't require it to hold shape--not so great for cutting shapes or making figures--but really fun just the same. Stir together the liquid ingredients including the food coloring. Stir in the flour until you reach a consistency that you're happy with. You can add a few drops of peppermint or orange essential oil if you'd like. The dough can be stored in a plastic baggie and left in the fridge when not in use.